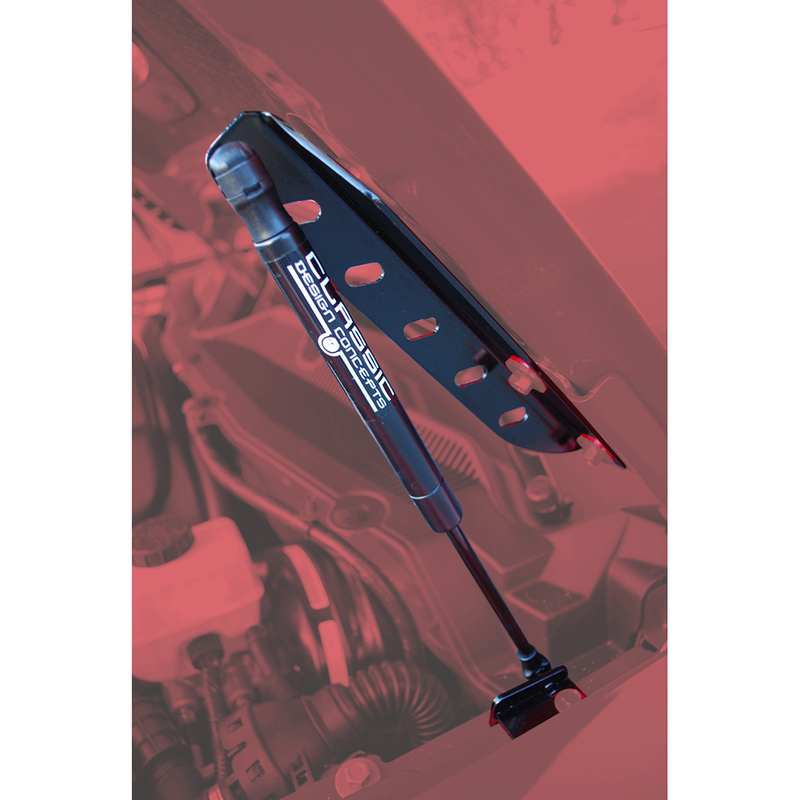 Whether you plan on working on your Mustang's engine or simply want to show if off, these Hood Struts are the simplest, cleanest, and most convenient way to keep your hood open. This component eliminates the need for the factory hood prop system which cleans up the look of your Mustang significantly. *NEW PRODUCT! We have now developped a light-weight hood strut for aftermarket hoods which are lighter than stock. These lightweight hood struts is designed for carbon fiber and lightweight hoods similar to the World Challenge hood and the 302S and R hoods. * - The CDC Hood Struts mount at factory bolt locations requiring no drilling. Fits GT, V6 AND GT500! - Simple, functional, clean fit with a custom look. - The gas-charged struts are OEM quality and the laser cut steel brackets are powder coated in your choice of black or silver. NOTE: Please take the following into consideration when installing CDC's Hood Strut Kit with an aftermarket hood (i.e.- fiberglass or carbon fiber hoods): - Some light-weight aftermarket hoods may not be as rigid as the factory hood and may bow slightly due to the pressure of the strut. - Other aftermarket hoods may weigh too much for the struts which may not provide enough support in the open position. 2005 2006 2007 2008 2009 2010 2011 2012 2013 2014 V6 GT GT500. No one else can stack up to the bold clean styling of our aftermarket Billet dress ups, Street Strip & Racing Suspension & Performance Parts for your late model American Muscle Car!